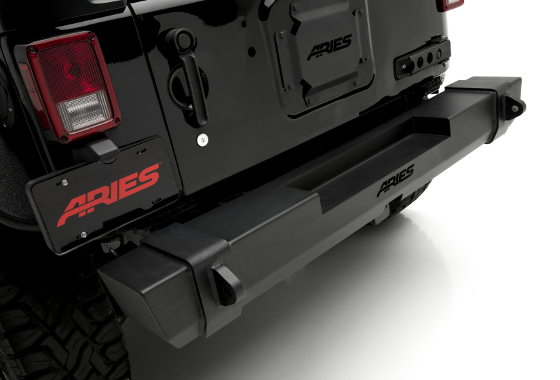 Dallas, TX -- April 26, 2017 -- ARIES Automotive, a fast-paced marketer and innovator of truck, Jeep, SUV and CUV accessories, has created the ultimate combination of form and function in the all-new TrailCrusher™ Jeep bumper. This one-piece, all-steel behemoth is built to work hard on the trails, featuring a higher winch-and-shackle rating than most other Jeep bumpers on the market today. 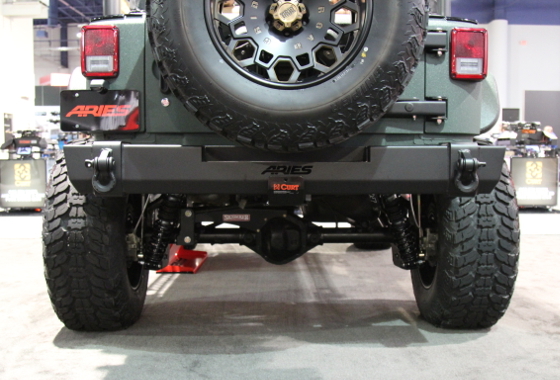 The TrailCrusher™, available for the front and rear, is all about maximizing the functionality of the Jeep Wrangler JK. With its one-piece, welded, 3/16" thick steel design, it features a superior weight rating of 12,500 lbs. This 12.5K rating applies to the winch and shackle mounts on the front bumper and the shackle mounts on the rear bumper. It provides dependable strength for a variety of recovery towing applications on or off the road. Not only does the TrailCrusher™ bumper offer a higher weight rating compared to other Jeep bumpers in its class, it is also designed to be compatible with a variety of accessories. The winch mounting platform is equipped with slotted, industry-standard holes to accept most types of winches. 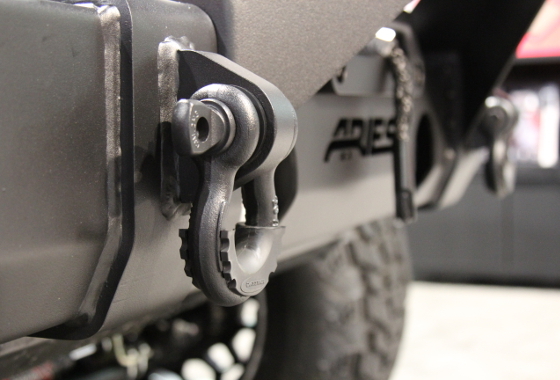 Likewise, the shackle mounts will accept ARIES shackles #2166071 or other shackles with a 7/8" diameter pin. 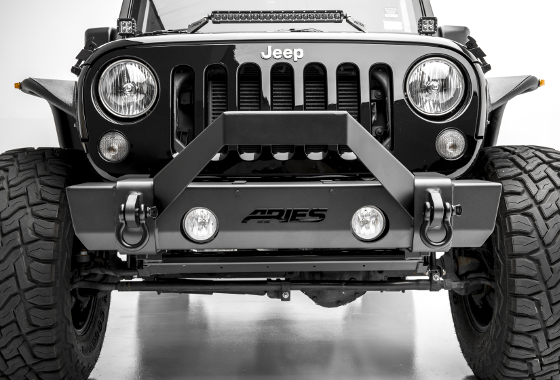 The TrailCrusher™ can also accept a stinger-style angular brush guard #2156050 to help protect the winch, as well as a hawse fairlead #2156070 or roller fairlead #2156071. 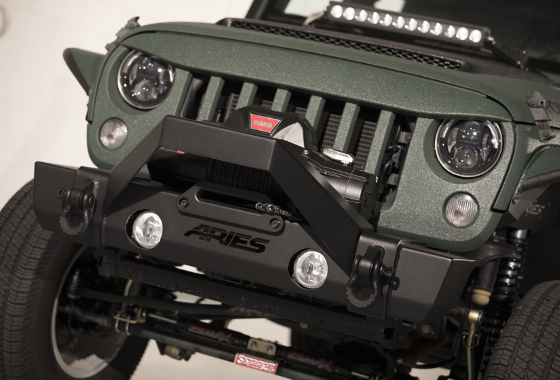 Both the front and rear TrailCrusher™ bumpers are built for a vehicle-specific fit on the 2007-2017 Jeep Wranlger JK. This means no drilling necessary and no factory pump relocation required on the front bumper. The TrailCrusher™ also comes with a highly durable E-coat and carbide black powder coat finish for maximum rust and chip resistance. To see a video about the new TrailCrusher™ or to become an ARIES dealer, click here.